Under the leadership of the Parish Clark, Mr Scaife, Hampton Lucy (Civil) Parish Council would like to investigate the possibility of generating "sustainable" electric power from the River Avon running next to the village. The School has "offered" the services of an MEng Group Project to evaluate the possibilities. The Avon already supplies nearby hydro-power, since for some 200 years (perhaps much more) there has been a watermill close to the village. The mill is still operating (grinding maize flour for chapattis); the miller is Mr John Beddington who has been working the mill (two undershot water wheels) for about 20 years. The civil works for the watermill - main dam across the river, 300m leat, diversion channel etc may be partly available for the new project. However no significant (i.e. over say 6cm) drop in the water level at the watermill intake is tolerable. The drop from A to B is about 1.1m, that from B to D is about 1.2m or maybe more, that from A to B is about 0.1m when the mill is operating at full flow. The main river is not open to navigation. The island was abandoned for agriculture as it sometimes floods in summer. The leat is suprisingly wide (10m?) and is partly choked by reeds. 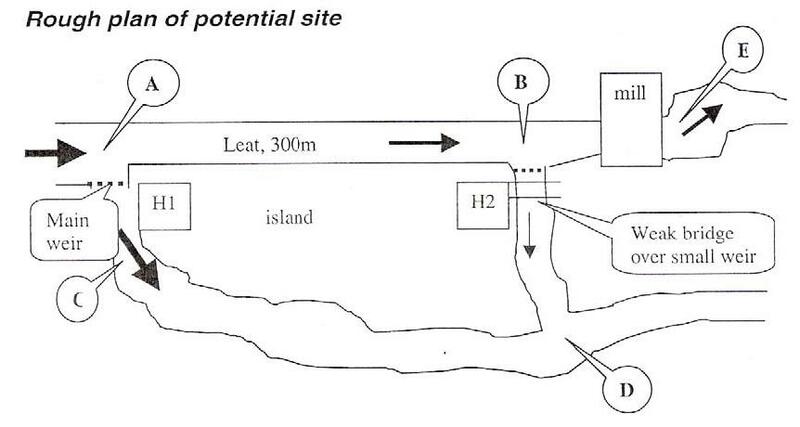 H1 and H2 are possible sites for micro-hydro; H2 is nearer to existing low voltage (440V) and medium voltage (3.3kV) overhead electricity lines. Where is the best site for a hydro plant, taking into account flooding (and flood reduction), economics, the interest of the miler etc? At what flow and head should it be rated? Should it somehow connect directly to electricity users in the village or just to the local electricity distribution network? What will the plant cost and how can benefit:cost ratio (or internal rate of return) be maximised? How might the plant be financed, owned, and managed? Who are the stakeholders in this project and how can their interests be accommodated in the decision making? What should the detailed civil, mechanical, and electrical design be? The key issue for project management is how to balance efficiency in performing specific tasks (by breaking down the overall task and assigning each part to particular individuals) with maintaining coordination and "ownership" of the whole by the Project team.